On the day after his induction to the International Tennis Hall of Fame, the one and only Andre Agassi will thrill fans once more when he takes to the legendary grass courts of the International Tennis Hall of Fame for the Hall of Fame Classic Exhibition Match. 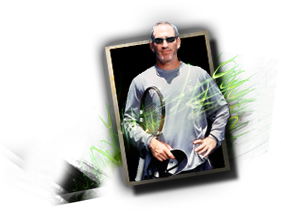 Agassi will pair up with his former coach and good friend, Brad Gilbert to play against Hall of Famer Owen Davidson and former top-10 ATP World Tour star Todd Martin. The match will be played at 10 a.m. on Sunday, July 10. Tickets are $35 and $45 and are available on tennisfame.com or by phone at 401-849-6053. Tickets will be sold at the gate, based on availability. “We are looking forward to a great weekend at the International Tennis Hall of Fame as we celebrate the induction of one of the most exciting athletes of our sport. We’re pleased to deliver fans the opportunity to see Andre back in action again, and to see him playing with his longtime friend and coach Brad Gilbert will be a particularly special highlight of the weekend. We know they’ll enjoy seeing Todd Martin and Owen Davidson in action as well, as they are always exciting to watch,” said Hall of Fame CEO Mark L. Stenning. An eight-time grand slam champion and Olympic gold medalist, Agassi held the No. 1 singles ranking for 101 weeks, and is one of the most exciting, adored tennis players of all time. During the height of his career, from 1994 – 2002, he was coached by Gilbert, who was a former top-5 player. Following his time with Agassi, Gilbert went on to coach Andy Roddick, Andy Murray and Alex Bogdanović. He is currently a tennis commentator for ESPN and is coaching Kei Nishikori. Australian Owen Davidson was inducted to the International Tennis Hall of Fame in 2010. “Davo”, as his is fondly known, is one of just 13 people who have won a calendar-year Grand Slam at the Tour level in the history of tennis, which he achieved in 1967 when partnered with Lesley Turner Bowrey and Billie Jean King in mixed doubles. Davidson will partner with former ATP World Tour star Todd Martin, who was a top-10 player on the Tour at the same time as Agassi. The two players faced off 18 times during their career, with Agassi taking 13 wins. Martin captured 8 ATP World Tour titles was a finalist at both the Australian Open and the US Open. For additional information about the exhibition match or to order tickets, fans should call 401-849-6053.